My recent prayer work has definitely gotten a boost lately. It’s always refreshing to get back on the ball, so to speak, after several weeks of having things go wonky or with other life events interfering in my Work and study, and (even though I’m guilty of procrastinating as often as not on this) prayer is one of the things I really enjoy. Sometimes I get a good spiritual buzz out of it, sometimes I engage with conversation and communion with the spirits, and sometimes I do it for the sake of contemplation or introspection. Regardless, prayer forms a good foundation for my spiritual work. Generally, my prayers don’t take that long to do, which may not be a great thing. Admittedly, I should probably slow down with my prayers and perform them in a more contemplative, slow manner, but it’s easy to just fall into the habit of falling into the right “feel” of the prayer and letting the words of the prayer carry me on from there. Prayer should be more than just words, after all. Something I’ve found helpful for me to slow down and focus more on the prayers individually are repeating them, especially with the use of prayer beads. I’ve been using them for years, often in the form of 108-bead malas (usually made of sandalwood or rosewood) for Buddhist mantras and, more recently, personal mantras or names using my 108-bead labradorite mala. Not too long ago, the good Michael Seb Lux helped me out with sharing a gnostic Marian rosary, since a rosary is also a style of repeated prayer using prayer beads. Since then, I’ve explored other styles of prayer beads, one of which is the chaplet used in Western Christian, especially Catholic, traditions. The word “chaplet” can refer to either the actual prayer beads themselves or the prayers to be done using the beads, and in either case help those who use them for prayer and devotion. There’s no set form to chaplets generally speaking besides the use of beads and repeated prayers, and not all chaplets have official status or recognition, though a good number do. One of the most common chaplets is the generic “niner” chaplet, which consists of a medallion of a saint or holy image, followed by nine beads (either evenly spaced or spaced into three groups of three beads), sometimes followed by a crucifix. One begins by holding the saint medallion and invoking the saint (e.g. “Saint NN., pray for us”); on each set of three beads, one says a Pater Noster, a Gloria Patri, and an Ave Maria; on the crucifix, one says the or some other personal prayer. Sometimes these niner chaplets are done as part of novenas or as a novena, repeated for nine days. It’s simple and generic, and generally useful for pretty much any saint or holy figure. As with all chaplets, praying a simple niner chaplet in the name of some saint can further one’s devotion, relationship, and intercession with them, which is no bad thing, especially if you plan to call upon them for help or in ritual. However, many saints have their own special chaplets designed especially for them, with a certain number of beads in a particular order or arrangement, some with a crucifix, some not. Often, there are customary colors for each of the saints, such as red and gold for Saint Michael the Archangel, red and white for Saint Philomena, and so forth. In this sense, the rosary itself is essentially a specialized chaplet celebrating the Mysteries, and is particularly associated with Mary. There are many types of specialized chaplets, some devoted to a particular saint or to a particular event, and unlike novenas or other well-known prayers, many chaplets are unofficial and used primarily in personal devotions but are kept in a fixed way according to custom and tradition. I personally use the chaplet of Saint Michael the Archangel and the chaplet of Saint Gabriel the Archangel once a week (Sundays for Michael and Mondays for Gabriel) which I’ve found to not only improve my relationships with the angels themselves but also substantially reinforces any magic done with them when used in a ritual. To that end, I was wondering whether there might be a chaplet associated with my newest spiritual ally and teacher, Saint Cyprian of Antioch. I didn’t have very many hopes of this, since Saint Cyprian isn’t that well-known of a saint except by folk traditions, and he’s often confused with the similarly-named but as poorly-known Saint Cyprian of Carthage. Even then, though, Saint Cyprian of Carthage didn’t have his own chaplet, so my options were limited. I didn’t feel like using a simple niner chaplet for Saint Cyprian was good enough for me or for him, so I decided to design and write up my own Chaplet of Saint Cyprian of Antioch. This chaplet consists of a medal of Saint Cyprian of Antioch, followed by three beads, attached to a ring of 27 beads separated into three groups of enneads (a set of 9 beads) with three separator beads. The medal and three initial beads are attached to one of the separator beads. The beads should be colored according to the preferences of Saint Cyprian of Antioch: dark red, purple, indigo, black, and white. I suggest black and purple beads, given his associations with some African Diasporic gods like Babalu Aye. 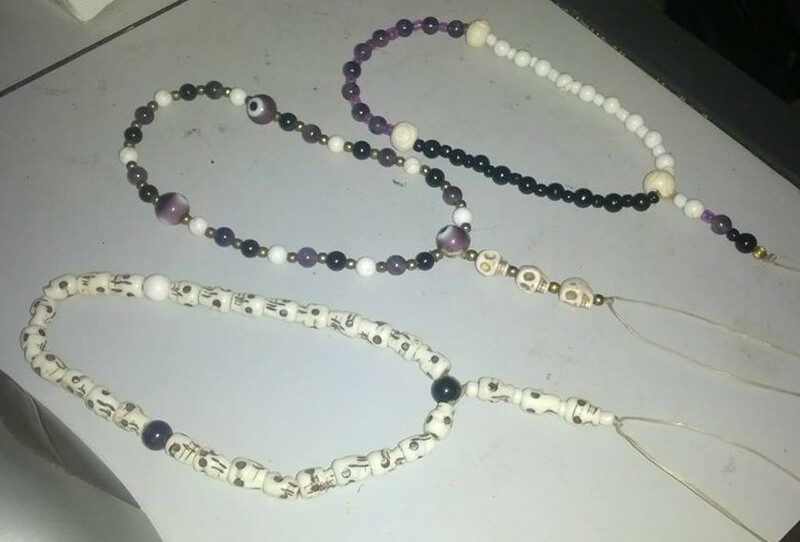 Alternatively, you might consider the first ennead to consist of black beads, the second to consist of purple beads, and the third to consist of white beads. When using precious or fancy beads, I find that onyx, jet, or black tourmaline; amethyst or garnet; and howlite, white agate, or bone work very nicely; for wood, ebony, rosewood, and white oak would be excellent. Since Saint Cyprian of Antioch medals are hard to come across, a crucifix can work instead, calling on the power of Christ through the intercession of Saint Cyprian of Antioch; a simply named “Saint Cyprian” medal (usually of the image of Saint Cyprian of Carthage) can suffice, since the two saints are often confused enough to merge the two. If these can’t be found, a black-and-white evil eye charm or large skull bead can work instead. Be creative and work with what you’ve got. Since the number 9 is sacred to Saint Cyprian, I figured it was appropriate to have the sets of beads have nine each. Each of the three enneads represents one of the three persons of the Trinity (Father, Son, and Holy Spirit), as well as the three stages of Saint Cyprian’s life (initiate, magus, and saint). The medal and the first three beads form the introduction, praying an act of contrition (though I’m waffling between using this and the Confiteor instead) followed by two prayers to Saint Cyprian, one Orthodox and one Catholic. The chaplet generally consists of the formula “Saint Cyprian of Antioch, …, pray for us”, each prayer followed by a Gloria Patri, with the middle of the prayer containing a short description of an event from the life of Saint Cyprian, and the beads separating the enneads indicating one to pray the Pater Noster. The descriptions of Saint Cyprian are combined from a history from the Orthodox tradition as well as a prayer of Jason Miller to the good Saint Cyprian. Medal: Saint Cyprian of Antioch, pray for us, now and at the hour of our death. First Bead: O my God, I am heartily sorry for having offended you, and I detest all my sins because they offend you, my God, who are all good and deserving of all my love. I firmly resolve, with the help of your grace, to confess my sins, to do good, avoid evil, and to amend my life. Amen. Second Bead: Saint Cyprian of Antioch, you were converted from the art of sorcery, O divinely wise one, to the knowledge of God, and were manifested to the world as a most wise physician, granting healing to those who honor you, O Cyprian together with Justina. With her, then, entreat the Master, the Lover of mankind, that He may save our souls. Amen. Third Bead: Saint Cyprian of Antioch, who by Divine Grace was converted to the faith of our Lord Jesus Christ, you who possessed the highest secrets of magic, build now a refuge for me against my enemies and their evil deeds. For the merit that you obtained before God, Creator of Heaven and Earth, cancel out evil spells, products of hate, the spells that hardened hearts have cast or will come to cast against my person and against my home. With the permission of God Almighty answer my prayer and come to my assistance, for the blood of our Lord Jesus Christ. Amen. First Separator: Pater Noster, &c.
Saint Cyprian of Antioch, born to pagan parents, pray for us. Gloria Patri, &c.
Saint Cyprian of Antioch, dedicated to the god Apollo as a child, pray for us. Gloria Patri, &c.
Saint Cyprian of Antioch, taught sorcery in Olympos, pray for us. Gloria Patri, &c.
Saint Cyprian of Antioch, taught illusion in Argos, pray for us. Gloria Patri, &c.
Saint Cyprian of Antioch, taught witchcraft in Tauropolis, pray for us. Gloria Patri, &c.
Saint Cyprian of Antioch, taught necromancy in Sparta, pray for us. Gloria Patri, &c.
Saint Cyprian of Antioch, taught enchantment in Memphis, pray for us. Gloria Patri, &c.
Saint Cyprian of Antioch, taught astrology in Chaldaea, pray for us. Gloria Patri, &c.
Saint Cyprian of Antioch, master of all the occult arts, pray for us. Gloria Patri, &c.
Second Separator: Pater Noster, &c.
Saint Cyprian of Antioch, magus residing in Antioch, pray for us. Gloria Patri, &c.
Saint Cyprian of Antioch, approached by Aglaias to seduce Justina, pray for us. Gloria Patri, &c.
Saint Cyprian of Antioch, unleashing demons of lust upon Justina, pray for us. Gloria Patri, &c.
Saint Cyprian of Antioch, unleashing demons of deception upon Justina, pray for us. Gloria Patri, &c.
Saint Cyprian of Antioch, unleashing the Devil himself upon Justina, pray for us. Gloria Patri, &c.
Saint Cyprian of Antioch, wringing disaster on Antioch against Justina, pray for us. Gloria Patri, &c.
Saint Cyprian of Antioch, casting deadly illness upon Justina, pray for us. Gloria Patri, &c.
Saint Cyprian of Antioch, all magic defeated by the prayers of Justina, pray for us. Gloria Patri, &c.
Saint Cyprian of Antioch, seeing Truth and rebuking the Devil and his snares, pray for us. Gloria Patri, &c.
Third Separator: Pater Noster, &c.
Saint Cyprian of Antioch, burning his books in sacrifice to God, pray for us. Gloria Patri, &c.
Saint Cyprian of Antioch, confessing repentantly for his sins before all Antioch, pray for us. Gloria Patri, &c.
Saint Cyprian of Antioch, baptized in the name of the Blessed Trinity, pray for us. Gloria Patri, &c.
Saint Cyprian of Antioch, made priest within a year by his zeal for holiness, pray for us. Gloria Patri, &c.
Saint Cyprian of Antioch, made bishop to lead all to divine virtue, pray for us. Gloria Patri, &c.
Saint Cyprian of Antioch, condemned to death by the Romans, pray for us. Gloria Patri, &c.
Saint Cyprian of Antioch, beheaded and departed into Heaven, pray for us. Gloria Patri, &c.
Saint Cyprian of Antioch, entering into the communion of the holy saints, pray for us. Gloria Patri, &c.
Saint Cyprian of Antioch, preserving us from all evil arts and acts, pray for us. Gloria Patri, &c.
Once completed, the chaplet may be concluded with any personal prayers to Saint Cyprian of Antioch or with something more general, such as the Creed of the Faith. The chaplet may be prayed at any time, but is especially fitting on Saint Cyprian’s feast day (September 26 in the Western tradition, October 2 in the Orthodox tradition) or on Saturdays, the day of the week associated with Saint Cyprian, and generally at nighttime, especially midnight. Saying the chaplet for nine consecutive days can be sufficient for a novena to Saint Cyprian, though there already exists a novena (available mostly in Spanish, but I’ve got my own translation in line for a future ebook). The chaplet pays to be prayed slowly and carefully, as any prayer might; by doing it slowly, the chaplet should take about 10 minutes to perform. « Hail, Saint Isidore of Seville! Another reblog. Saint Cyprian is a wise adviser. Making contact with him is one of the best things a sorceress/sorcerer can do. The chaplet detailed in this reblog is sheer genius. I suggest we all give it a try. This was definitely helpful. I’m trying to figure out this whole spirituality thing and I definitely don’t feel Christian but I grew up Catholic and there’s a familiarity with chaplets. I went searching for this specific rosary and stumbled on this blog and it was definitely a good read. I was gonna stick with just a typical obsidian rosary before this.